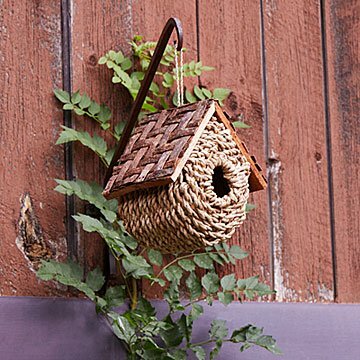 Filipino artisans craft each house from local materials, creating a cozy space for feathered friends. Just like us humans, sometimes birds just want to go on a tropical vacation. This thatched bungalow gives them their own little piece of paradise. Filipino artisans craft each one from locally sourced rope, wicker, and twigs, creating a cozy home for feathered friends. Hang one or a few in your backyard, ideally next to the bird bath infinity pool or that tiki bar everyone's tweeting about. Handmade in the Philippines. Brush or wipe clean. Keep the product dry to prolong its lifespan. I liked this birdhouse because it was a bit different from all that I have already. I put it up near my feeders and I am not sure if anyone has made it their home yet but they will soon I am sure. It is very well made and looks great up against the woods in back of my home. Thank you for wrapping it inside the box! She was able to open it on her actual birthday!